Disclosure: This is a sponsored post partnering with Fandango Family. I received compensation, but all opinions expressed are solely my own. There are many exciting movies coming out this Fall and Winter, but the one that my kids are currently asking about is The Good Dinosaur, which comes out on November 25. This is the latest release from Disney/Pixar so we are pretty much assured it's going to be phenomenal. This story is about the dinosaur Arlo, separated from his dad, who must find his way back with the help of friends that he meets along the way. From humans to other dinos, he discovers trouble and friendship around every turn. Since this will probably be the animated blockbuster of the season, my family had to get creative and make something to celebrate. 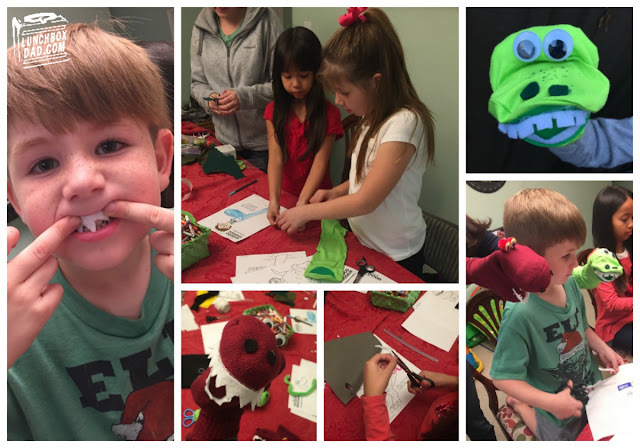 We thought, "What better dinosaur craft could there be than sock puppets?" It's easy to think that our kids are mainly interested in tablets and video games, but don't underestimate the fun and bonding that can come from doing a project with your kids and putting on a show together. 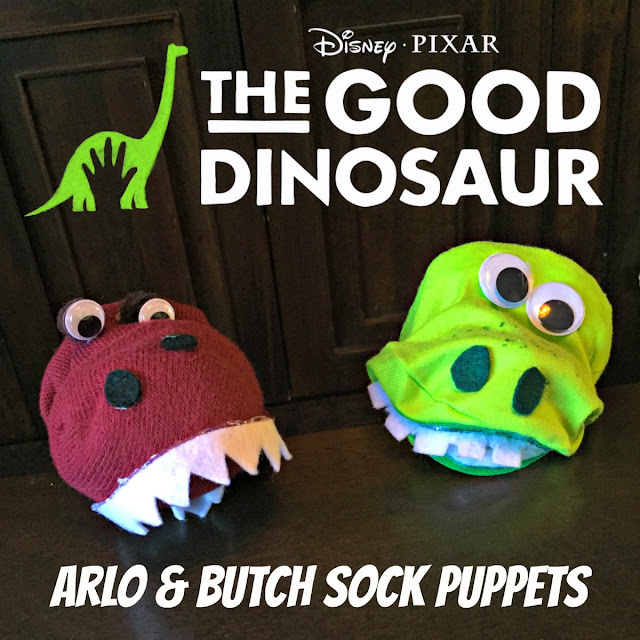 To make the Arlo and Butch sock puppets, just follow my easy instructions below. I've even included FREE printable coloring sheet downloads at the end of this post. Use this for a rainy day activity or just on a lazy Saturday morning. Whatever you do, make sure and head to Fandango to get your tickets for The Good Dinosaur on November 25! Cut two rows of square teeth out of white felt. Cut two rows of sharp teeth out of white felt as well. Cut four small to medium sized circles out of black felt for nostrils. 1. Ball up 4-5 tissues and place them toward the end (but not quite the end) of the green sock. 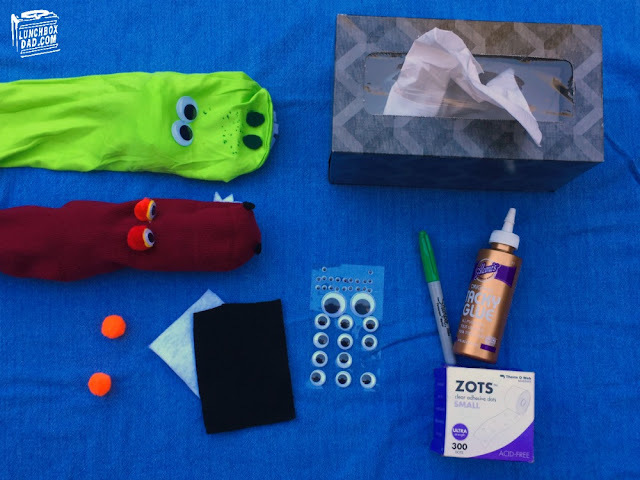 You will use the tissues where you place Arlo's eyes. Put your hand in the sock like you are using the puppet. 2. Glue googly eyes onto sock directly next to each other. Glue nostrils on sock on the end of Arlo's nose. Glue one row of square teeth to the top of his mouth and one row to the bottom. 3. Finish by making freckles on Arlo's snout with a green marker. 1. Glue googly eyes to fuzzy pom poms. 2. Make two balls of tissues. Stuff one ball into the end of sock. Put other tissue ball where your thumb will go in sock puppet. Place hand in sock puppet like you are using it. 3. Glue pom pom eyes onto sock right next to each other. Glue nostrils on the end of Butch's nose. Glue one row of sharp teeth to the top of his mouth and one row to the bottom. Now that you've made the dinosaurs, have some fun creating stories where you, your kids, Arlo, and Butch are the stars. 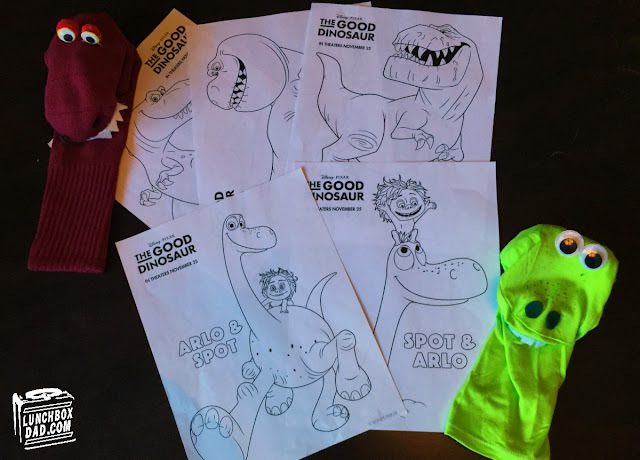 These puppets might even be perfect for your kids to take to see The Good Dinosaur with your family!